I'm a big condiment and sauce person. I love a good salsa, chutney, relish, pesto, and this tahini-yogurt yogurt dip. A good sauce adds so much flavor to a dish, and I make sure to savor every last drop. When I first encountered romesco sauce I was blown away. Where has this bold, smokey goodness been all my life? Roasted bell peppers. Garlic. Hazelnuts. 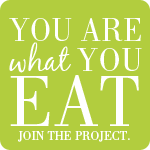 I wanted to (and have) eaten it on everything from omelets to potatoes to polenta cakes to sandwiches to spoonfuls by itself. 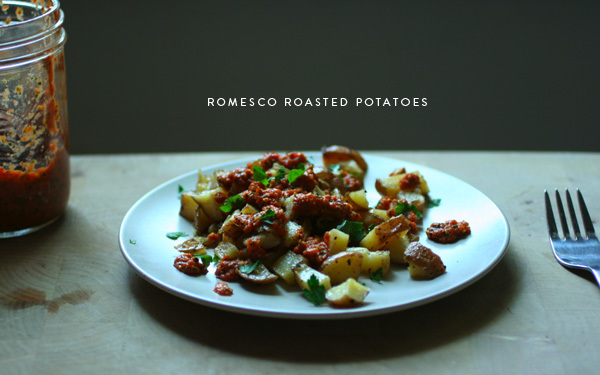 I was excited to see that this week's Food Matters Project was a recipe for romesco. Check out the original recipe by Mireya and see what creative ideas others made here. I roasted off some red potatoes with a generous glug of olive oil, salt, and pepper. Then I generously topped them with romesco before digging into a bowl myself. This is the perfect condiment for an omelet with a side of roasted potatoes and cold brew on a lazy weekend morning. Preheat your oven to 400. Cut the tomato into wedges (or halve the cherry tomatoes) and drizzle with olive oil, salt, pepper. Add tomatoes to a baking sheet along with the two bell peppers. Roast for about 30 minutes. The bell peppers should be browned and starting to blacken in spots. Remove from oven, put into a plastic freezer bag, and seal. Set aside and let cool. Remove tomatoes from the oven and let cool on the baking sheet. Keep the oven on and toss the hazelnuts onto a baking sheet. Bake for 8 minutes or until they start to release their sweet, nutty smell. Remove from the oven and put onto a kitchen towel. Gently cover with the other side of the towel and lightly rub the hazelnuts, so some of their skin will fall off. Set aside. After the peppers have had time to cool, remove from the plastic bag and peel their skins off. Remove the stem and the seeds inside. Cut into strips. Mix all the ingredients, except the oil into a food processor. Process until smooth. Drizzle in the olive (or walnut) oil and taste for salt. Eat on everything. Romesco is one of my most favorite things. Ever. Always with potatoes. Yum! Your dish looks like one that I could expect to see at a good tapa bar. Looks delish! ummm, love your addition of chili flakes and paprika, and the 2 peppers! mine looked green instead of red and i wish i paid the extra dollar for a red bell pepper or two! 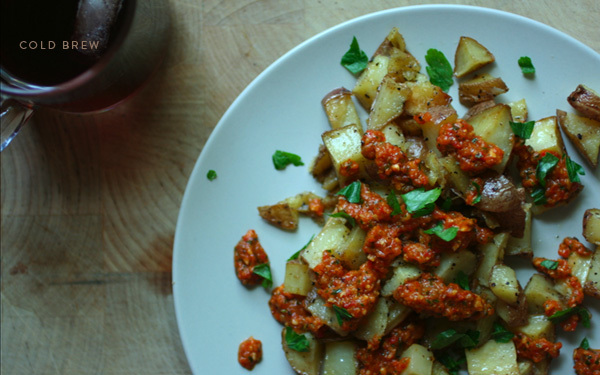 Romesco with roasted potatoes sounds like a wonderful combination! Charred and hearty and spicy all at the same time--hooray! Beautiful! And what a lovely combination with the potatoes. Pinned! Such a great way to serve this! Adrienne, your potatoes are gorgeous! I didn't manage to make the romesco sauce this past weekend, but plan to try it soon. Gorgeous photos, Adrienne! 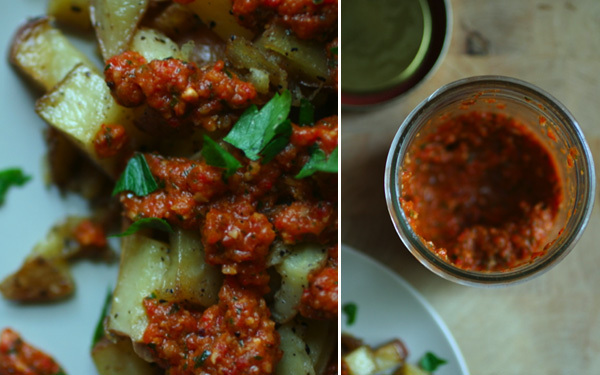 I used my leftover roasted potatoes today as a vehicle for some leftover sauce...yum! Looks wonderful. I enjoyed this recipe too! I do like my condiments too and fell in love with this sauce. Delicious! Ooo, I want to make it with hazelnuts (had almonds)- wonder how the flavor will be different! I can't believe this is the first time I came across this sauce, so good! I don't know that I've ever had Romanesco sauce but like you I'm a huge condiment ho so I bet I'd love it. Any substitutes for hazelnuts? They're sometimes hard to find round my parts. heidi@foodiecrush substitue almonds for the hazelnuts! I love potatoes cooked in coconut oil. VidMate Download For Samsung built for fans of the song. This is just an incredible song app for the millions of songs from YouTube. Get the app, find, organize and play a lot of the cost of a song or playlist with ease.